Allowing your pet to move better! ANNOUNCING A THIRD LOCATION AT OZ ANIMAL HOSPITAL EVERY OTHER SATURDAY!! Call 708-955-1884 to make your appointment!!! Most people have at least a slight familiarity with chiropractic care for humans. Many, however, may not be aware that similar care is available for their pets. Chiropractic can be used in veterinary medicine for various reasons from easing pain to giving athletic pets an edge by helping to keep their bodies tuned. For some pets, the benefits of chiropractic are immediate and visible. Chiropractors carefully manipulate joints to restore correct alignment, which is believed to improve nerve function throughout the body. Through examination, practitioners aim to identify and then treat subluxations, or misalignments of joints. These misalignments result in a change in nerve function, which may present as limping, behavior changes, and/or pain. Does My Pet Need Chiropractic Care? Generally, no. Most pets visibly relax during a chiropractic adjustment and, many happily greet their veterinary chiropractor at their next visit. If your pet is already in pain, the veterinary chiropractor may need to work on that area of your pet’s body and there may be tender points. The discomfort is very brief and your pet should feel much better afterwards. Depending on your pet’s condition, your first appointment may take 30-45 minutes. Follow-ups are generally quicker and should take less than 30 minutes. Can Anyone Perform a Chiropractic Adjustment On My Pet? No. 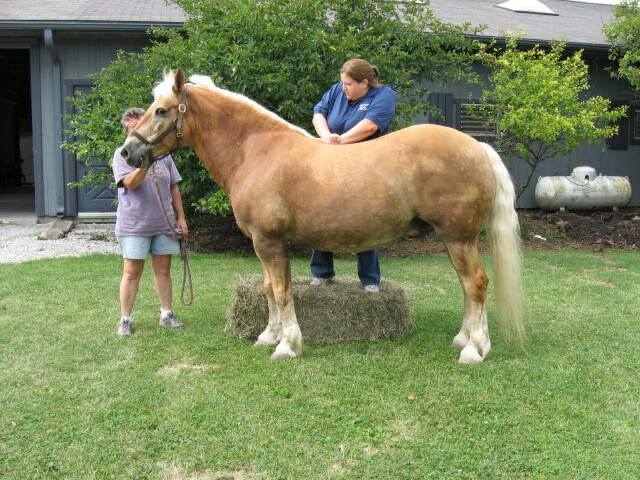 Only a licensed chiropractor or veterinarian that has taken an approved course can adjust animals. Be aware that there are several short weekend courses that claim to certify a person in veterinary chiropractic in less than 2 days. Dr. King has taken a 226 hour post-graduate course at the Healing Oasis Wellness Center in Sturtevant, Wisconsin, which is the only program approved by the US Department of Education. Dr. King see small animals at Palos Animal Hospital in Palos Heights, Four Legs Pets in Gilberts, Oz Animal Hospital in Lincoln Park! Horses are seen at their location. All housecalls are made at the discretion of the doctor. Please note: all appointments are scheduled with Dr. King by calling the number below. Call (708) 955-1884 to schedule an appointment for your pet! 5% of your first visit will be donated to Hoof Woof and Meow Animal Rescue. Sign-up using the form or call us at 708-955-1884 to take advantage of this exclusive offer. "Thank you so much for adjusting Tarzan. It helped him so much when his back injury caused him so much pain that he could hardly walk. Your adjustments relieved his pain and allowed him to heal. Tarz is doing great! He is back to running, jumping and playing again. Tarz thanks you so much and I do too!"